Hopefully they can get the puck dropped by 8. 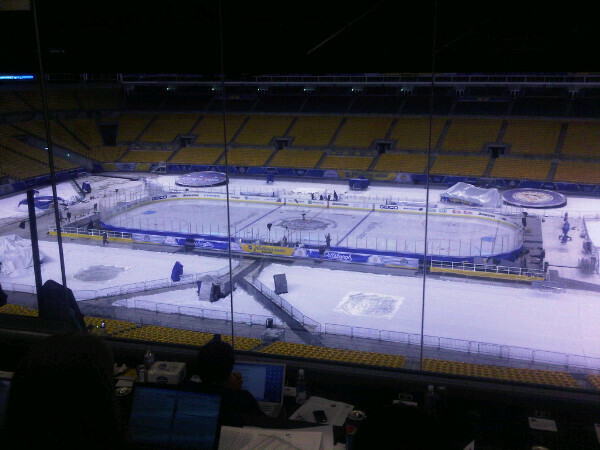 But if things go as planned it will be the first ever Winter Classic to be held at night. It is already the first ever NHL game to be rain delayed. The TV ratings in the US will skyrocket because it no-longer needs to compete with the likes of Penn St-Florida or the Rose Bowl. The only football game on at the time is Oklahoma-UConn which probably wouldn't have drawn ratings anyway. But people in certain markets of Canada are out of luck because it looks like CBC will be showing Ottawa-Toronto instead. Heinz Field will look awesome tomorrow night. Here's a pic taken by Pierre Lebrun. Jordan Staal may be making his highly anticipated return on hockey's biggest stage in prime-time. Or maybe he won't. The only one who can answer this question is Dan Bylsma, who has declared Staal a GTD. The final x-rays looked clear and Staal participated in practice at Heinz Field today so it all depends on how comfortable Disco is with starting him. Dan also said that the weather would not be a factor in his decision. Staal actually lost the shootout in practice today, but rather than having to sport a mustache his punishment was to run up Heinz Field and touch the sign marking section 527 (about as far as anyone can possibly be away from the field). I'm sure HBO will have the whole story on that next week. Yep, it ended in a tie. 5-5 was the score. Mario didn't score but he had a few assists. 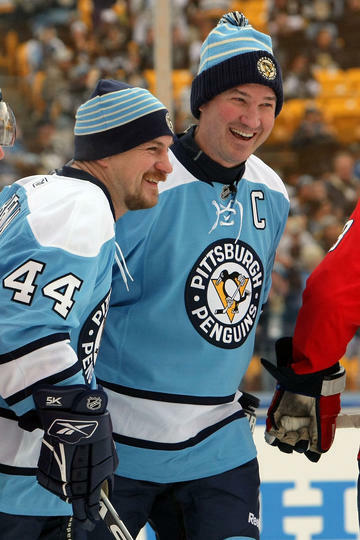 It seemed like nobody was really trying that hard to win and they all just seemed content to be able to skate on the Heinz ice before the actual teams did. I heard a few fan complaints about the game. The puck dropped before everyone had a chance to get in and there was no television coverage of the event. The only way to watch was a small box streaming on NHL.com and the Pens site. But all in all it was a good time and a way to make the old-timers more involved in the sport again. Here's a few photos (I didn't take them) of Pens practice today. Dupuis sporting a Steelers helmet to support the boys that usually call the field home. 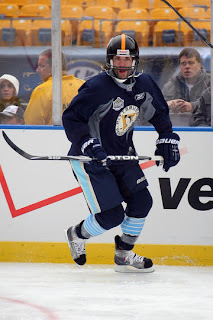 The players weren't exactly thrilled with the condition of the ice but the general consensus was that it was better than they expected and (assuming the rain doesn't cause total havoc) shouldn't be too much of an impediment to the game. So get ready because we are (hopefully) only hours away.